Voice control in GT-Command is an option for you. The assumption is that you insert the headset from GT-Command into the PC- female jack, and that you enable voice control in the process line in GT-Command. 1) Vehicle direction and speed, say: "Thomas forward 25", where Thomas is a legal train name. 3) Turnouts, say: "Tango 27 straight", where Tango means turnout, and T27 is the Turnout ID. 5) Automations, say: Alpfa 23 on", starts Automaion with ID A23. In general you state commands in "WHO WHAT HOW". Voice control is good for manual control where you need your eyes and hands on the lay-out, say manual shunting, station control, and more. 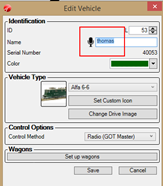 In the GT-Command solution you use standard names for loco functions, which are associated the functions in the vehicle type editor. You can change them if you like. Our Manual has a complete list over all commands available. In English use all names without Capital letters, the Mic symbol tells if the name is legal.